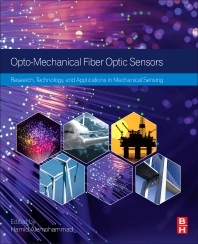 Opto-mechanical Fiber Optic Sensors: Research, Technology, and Applications in Mechanical Sensing offers comprehensive coverage of the theoretical aspects of fiber optic sensors (FOS), along with current and emerging applications in the mechanical, petroleum, biomedical, biomechanical, aerospace and automotive industries. Special attention is given to FOS applications in harsh environments. Due to recent technology advances, optical fibers have found uses in many industrial applications. Various sectors are major targets for FOS's capable of measuring mechanical parameters, such as pressure, stress, strain and temperature. Opto-mechanical FOS's offer unique advantages, including immunity to electromagnetic interference, high fidelity and signal-to-noise ratio, low-loss remote sensing and small size. 6. Femtosecond Laser-Inscribed Fiber Bragg Gratings for Sensing Applications. 7. Innovative Fiber Bragg Grating Sensors for Highly Demanding Applications: Considerations, Concepts, and Designs. Hamid Alemohammad, PhD, PEng is the co-founder and CEO at AOMS Technologies Inc. Dr. Alemohammad has PhD in Mechanical Engineering from the University of Waterloo in Canada. He has R&D and industrial experience in fiber optic sensors along with entrepreneurship experience in commercializing fiber optic sensors for harsh environments.